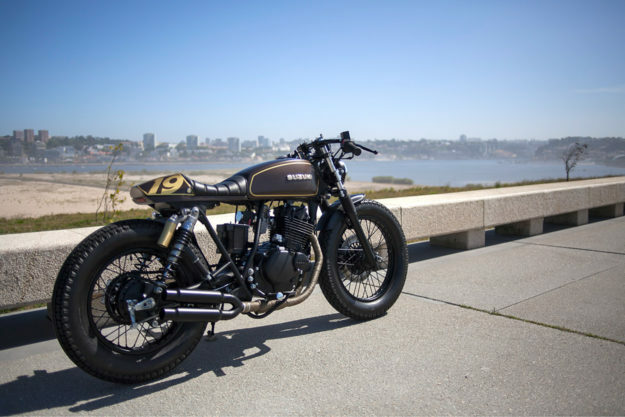 Customizing bikes is all about seeing potential. 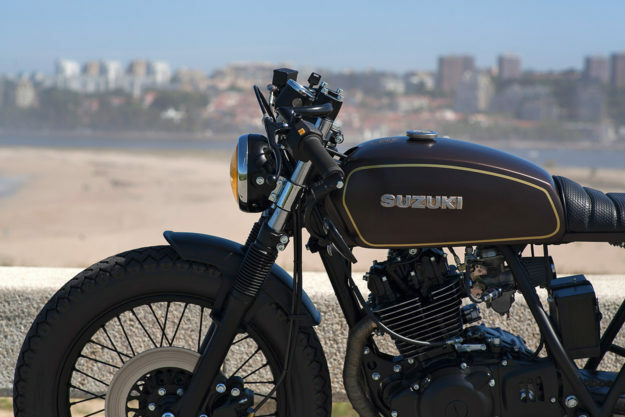 Case in point: this cute little ’92 Suzuki GN250 from Portugal’s Dream Wheels Heritage. 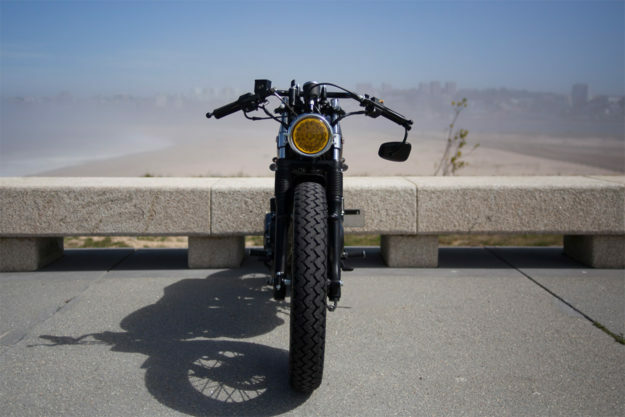 Back in the day, the GN was the go-to bike for riding schools and the Portuguese postal service. 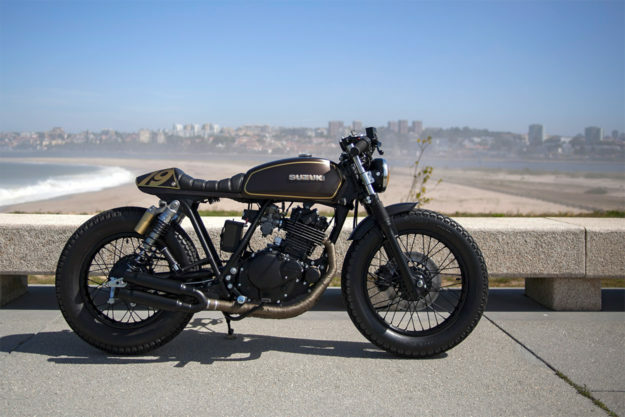 But this one’s been resurrected as a neat-n-tidy café racer, for delivering smiles around the island of Madeira. Dream Wheels’ client specifically wanted a bike with a traditional café look—but it’s the impeccable execution that has us sold. Take a look at the beautifully matched upper bodywork, for example. 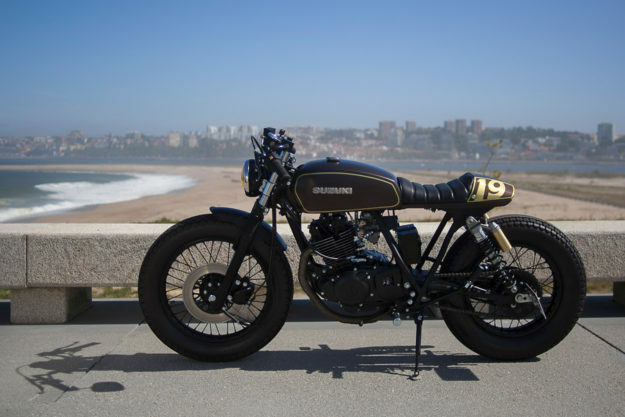 The tank has been adapted from a Sachs Lotus Special V5—a 50cc Portuguese bike made in the 80s. The seat hump is actually a removable hand-made cover, with passenger accommodations below. 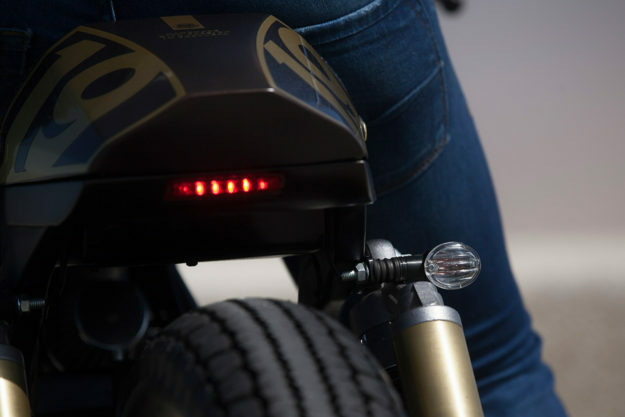 It’s perched on a custom-made subframe, with a discreet LED taillight built into the seat pan. The front fender and rear license plate bracket are hand-made, as is the new battery box. There’s a new gel battery in there too. For the exhaust, Dream Wheels combined two EMGO mufflers—connected to the headers via a one-off branch. The GN250’s also had a serious under-the-hood refresh. The engine’s been rebuilt from the ground up, and treated to a fresh coat of paint. 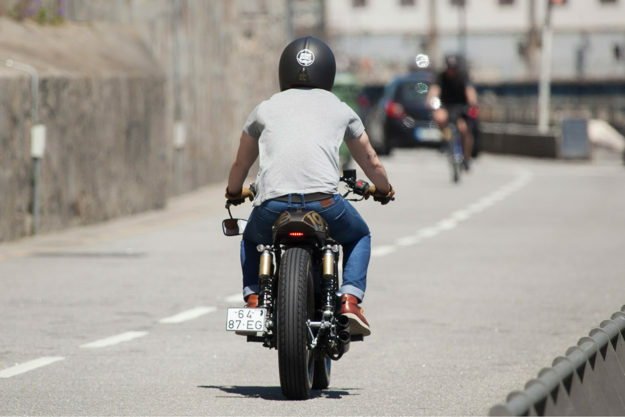 Smaller items—like the brake lines and fork boots—have all been replaced. There’s a set of Showa shocks out the back, taken off a Honda CB750. The front forks have been dropped a little to adjust the stance, and the 18” front and 16” rear wheels are running Avon Safety Mileage MKII tires. 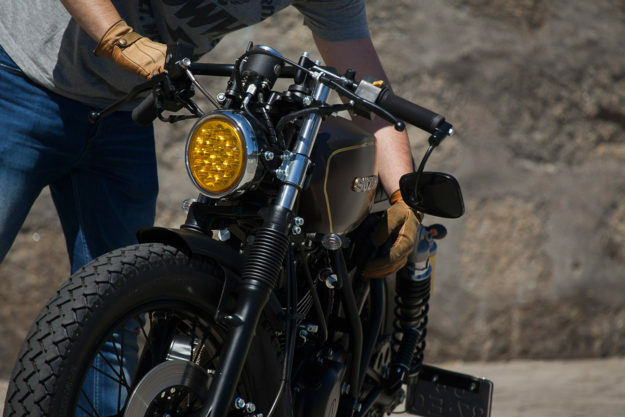 Up front is a set of clubman bars, kitted with Biltwell Inc. Kung Fu grips. The headlight is classically styled, but LED-equipped. 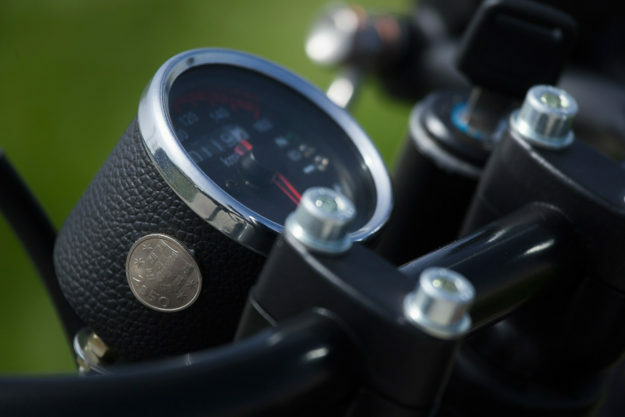 There’s a new mini-speedo too—wrapped in leather, with a vintage Portuguese escudo coin embedded in the side for luck. It’s a timeless aesthetic, finished off in an equally timeless color. Dream Wheels picked Mini Copper Hot Chocolate for the paint reference. 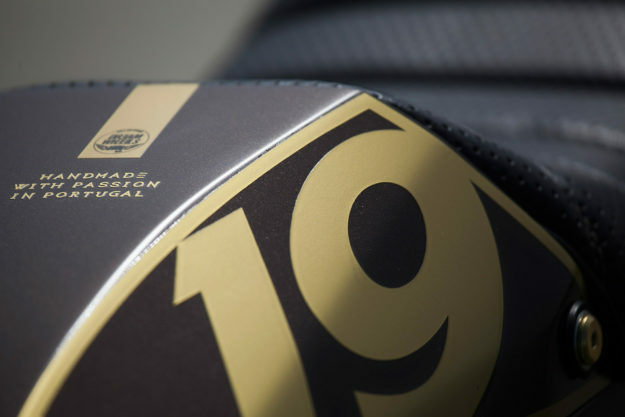 It’s been done in a matte finish with gold touches—including the owner’s luck number, 19. 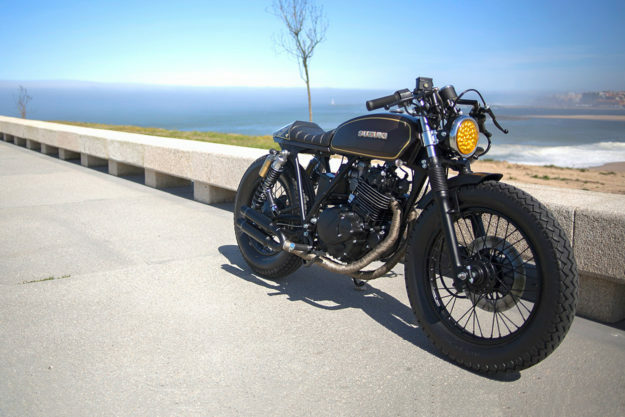 From forgotten delivery bike to perfect Mediterranean runabout… sounds like a pretty big improvement to us.